actually just told me about it yesterday hehe. more watches at a good price check out pre owned watches. Anyways, I hope you all have a lovely weekend! your vintage dress is just amazing! I also liked the shoes, and the total outfit.. goes incredible together! well done! 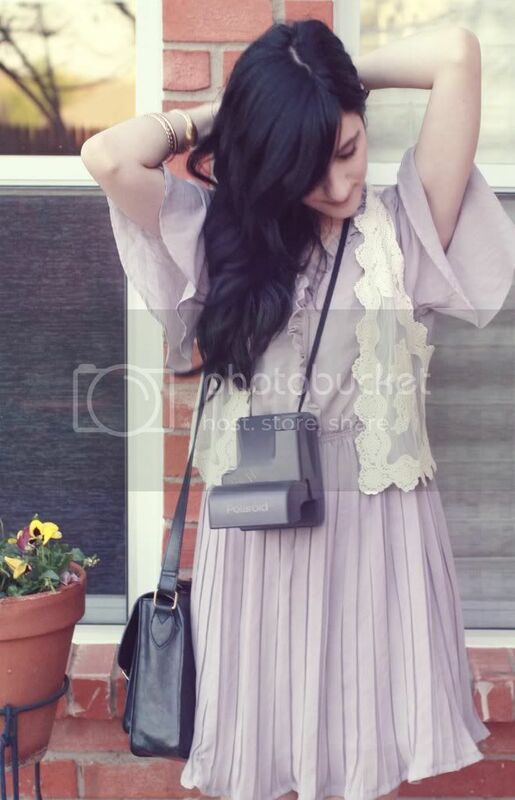 Love this outfit...have fun at the vintage store, looks awesome! Beautiful dress! And stunning photos! The stose seems really nice, wish we had something like that where I live..
You look absolutely cute ! Wow, Red Velvet sounds and looks amazing! I love that dress - it's uber feminine and so pretty! gorgeous dress, i love the colours and the pleat detail. you can find polaroid film on ebay but it's pretty expensive considering most of it is 5years out of date! that dress is uber cute!! Have a great weekend/springbreak! My uncle gave me a Polaroid camera just a couple years before they stopped making the film, and it makes me so mad!!! It's so expensive on ebay. Love this vest. I've been following for a while but rarely comment. Today I just HAD to comment on that dress. Unbelievable! Absolutely perfect. I want to buy a polaroid camera. love your dress, sweet color!! I love it! You look so lovely!! Hi, I've only been following your blog for about a week now, time to comment! I love this outfit, the lace vest is adorable. I just wanted to let anyone looking for Polaroid film know that The Impossible Project is a company from the UK that reverse engineered old Polaroid film to create a brand new film for all the old cameras. You can buy it for about 30 dollars online, and they have a shop in New York. I love the pleats and lace vest. This outfit is so romantic! I like the pastel colors, darling! Love your outfit, the colors are divine. Also, quite jealous that you get to go to Red Velvet, I've been wanting to go for awhile now. You'll have to tell us all about it! Wow, this is such a lovely dress! Love this lilac dress and those peach socks...absolutely beautiful outfit. Love these photos too...gorgeous! That's a lovely lavender dress you've got on......& the lace vest is lovely too! I've so got my eyes on that Polaroid cam of yours!! So lovely. I love the socks in combination with the Mary Janes. Wonderful outfit. What a lovely dress. The color is beautiful and it suits you very well. Nice find on the polaroid. love the pleats and the detail on this dress... I think I love the color the most, looks super cute on you! Love love love the beautiful delicate color of the dress! OMG I just realized you are stopping by Red Velvet! I adore Elsie and follow her blog. Super jealous. :) Hopefully you get some goodies! Amazing outfit; the color and the lace make it so feminine! Adorable dress ;)! You look great...as always :)! That dress is beautiful! I love the ruffles on the top and the perfect pleating on the bottom!! :) I'm sure you can find some cheap polaroid film on ebay! lovely outfit! it's such a cute dress! Absolutely gorgeous dress and the lace vest. You look fantastic! the color is stunning! i love how you used the old camera as a prop. i have a small collection of them but i wish i could find film!! pretty dress, love the color. oh my gosh this dress is so pretty and I hope you have a wonderful time with your boyfriend and his family. haha missour-ah. I had a substitute teacher in grammar school who called it Miz-zer and said she was from there and called it that. . .but other people i've met from there say it missour-ah so that is still weird to me. anyway you look gorgeous and have fun!!! The outfit is absolutely gorgeous! so delicate and girly. I have attempted to look for polaroid film for what seems like forever! And when i do find it it's 80.00 or more! :) Have a good time in Missouri! SO jealous of the polaroid camera! Post some photos, please! You look soooo gorgeous, dear! Love the light lilac-colour of the dress! vintage clothes + cupcakes?! must be heaven. Such a cute outfit! Especially the socks! Also: LOVE the pale purple. One of my fave. colors. such a beautiful dress and i love the colour! 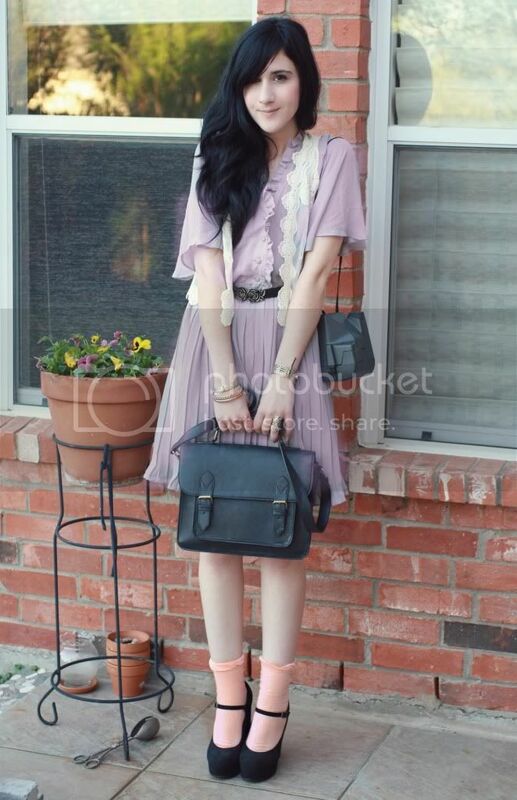 You look so dreamy and pretty in this lavender dress! I hope polaroid makes a comeback, I really want to buy more film and take so many pictures with my polaroid cameras! I love buying them at garage sales and thrift shops too! cupcakes and vintage clothing!! oh my I'm kind of glad theres not a store like that around here or my wallet would be in trouble!! also this outfit is like a dream...so beautiful girlie!!! i love the color of the dress, very dreamy!!!! ugh polaroid film is so awesome yet so pricey!! I love love love your dress, such a pretty outfit! polaroids are the best cameras! that colour suits so much!!! ohmygod, love it so much! Lovely outfit, I love the lace waistcoat. each day your looks are more and more gorgeous! !1 i love this skirt!! Oh, I LOVE this dress! So romantic! You look beautiful! omg that lace vest is TO DIE FOR lady! have fun at red velvet! say hi to elsie :) and btw, i don't think anyone else could pull off that dress like you do. bravo! 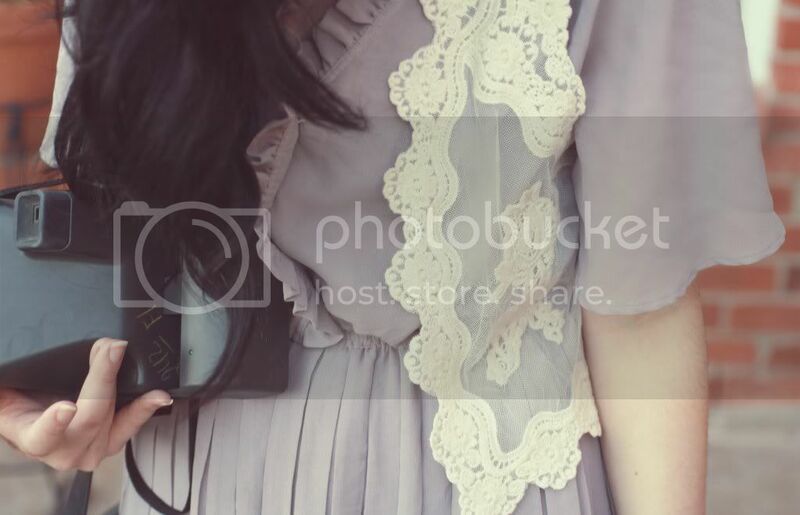 love the vintage dress, it's such a pretty colour and style. I have a polaroid camera from years ago, although no film. Once you find it it just seems to be so expensive! This colour so so light and beautiful. I love it. And of course, you look adorable. The vintage shops in Tokyo were totally amazing so not surprised that this dress is such a great piece. 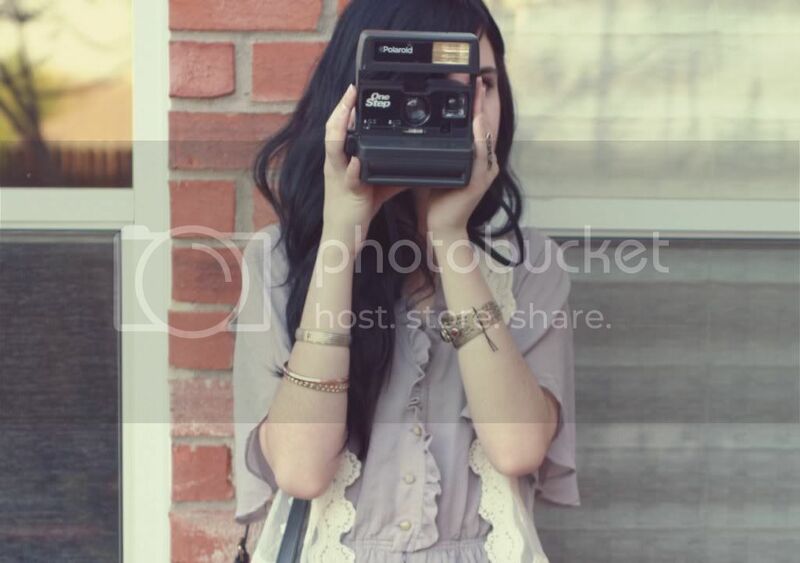 I love polaroid and your pretty outfit! the lilac is perfect with the peach :) lovely for spring! I LOVE your pastel moment here! The lilac of the dress is soo gorgeous, and it was brilliant to pair with the peachy socks! Love love love it, girl! Ooh, between the color & the pleats, I am quite smitten with the bottom of this dress! Lovely! I am so obsessed with this dress. The color is drop dead gorgeous again your hair and light skin! I need to find more clothes in this color and see if I can rock it myself like you do! 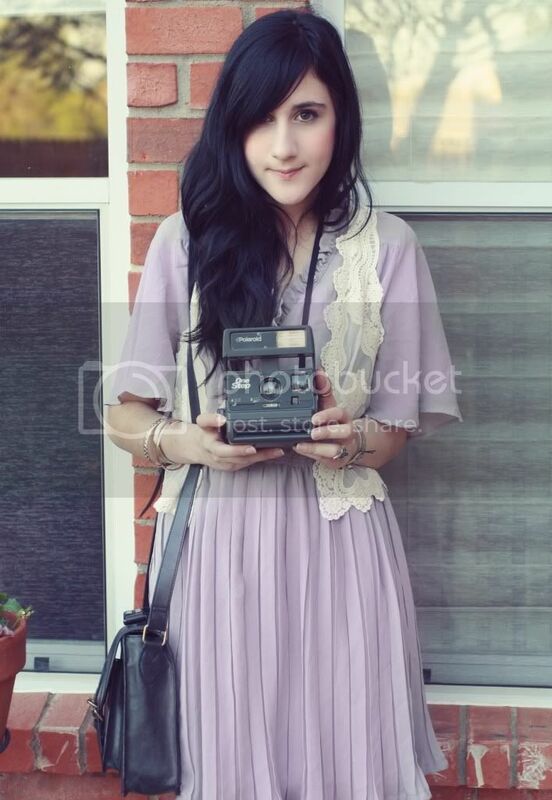 You can find Polaroid film on the internet (but it totally forget the website) ..
that dress is the prettiest shade of purple, i love it! Very cute! I love polaroid cameras! Very jealous that you got to visit the red velvet shop, one of my most favorite online shops & hope to one day visit it in person!